At the weekend I went to look at the new exhibition on coffee at the John Hope Gateway. The exhibition is borrowed from the Berlin Botanic Garden, but RBGE has added elements to it from its own collections. 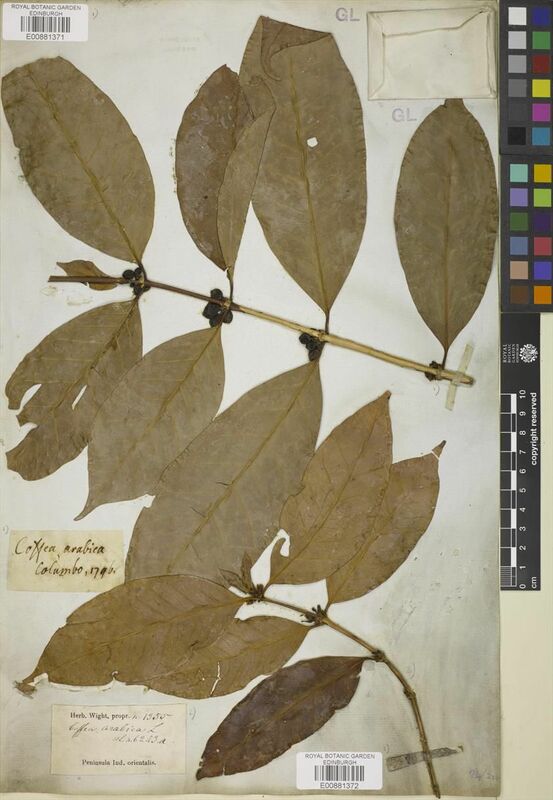 One of these is a specimen of Coffea arabica with no collector’s name, but the collection details ‘Columbo 1796’. The writing is that of Johann Peter Rottler (1749-1836), a German missionary and botanist who worked initially at the Danish colony of Tranquebar, and later in Madras, on the Indian Coast of Coromandel. The story behind this specimen is an intriguing one. The reason Rottler was in Ceylon in 1796 was as Tamil translator and plant collector to Hugh Cleghorn senior (1752-1837). Cleghorn was on a nefarious, but successful, mission to bribe the De Meuron regiment of Swiss mercenaries to change allegiance from the Dutch to the British. This was successfully achieved, with a relatively bloodless taking of Colombo on 14 February 1796, by which Ceylon became British. The specimen must have been collected at this point, though cultivation of coffee by the Dutch, since 1740, had actually been rather low-key and unsuccessful, as it was grown in the climatically unsuitable coastal regions. (And in any case the Dutch did not want it to compete with their successful cultivation of the crop in Java). The sheet on display bears two old labels (one 18th century, one 19th-century), indicating a complex history. The modern interpretation indicates that the sheet is from the herbarium of Glasgow University, but that is the least interesting of its associations. In fact, it originally formed part of the collection of George Walker-Arnott (1799-1868), and was given to him by his friend the Indian botanist Robert Wight (1796-1872). Rottler was still alive in Madras when Wight started his own botanical activities in the city, and purchased specimens from the venerable botanist, including this one and many other older ones from the Tranquebar collection made by Rottler himself, and by the missionaries Benjamin Heyne and J.G. Klein. However, the story is more complex as seen from the partly printed label at the bottom of the sheet, which shows that the specimen was at one point in Wight’s own herbarium, but also that there is a duplicate in the herbarium of the East India Company. This vast herbarium, catalogued and distributed by Nathaniel Wallich from London around 1830, consisted of material collected under Wallich’s own supervision, but also earlier material that had previously been sent from India to the HQ of the East India Company at East India House. Among this earlier material was a duplicate set of Tranquebar specimens sent back in 1828 following the abolition of the post of Madras Naturalist, and hence misleadingly known as ‘Hb. Madras’. Among this was clearly another of Rottler’s coffee specimens which is why it also has a ‘Wallich Catalogue’ number (6243A). Thanks for still sharing wonderful stories.